Sligo Estates is an independently owned Family run and operated property business offering top quality service with the strictest of confidence for all our Clients and customers. We are dedicated and will provide you with honest, expert advice, working on your behalf to ensure success. Our current clients enjoy the benefits of our proven expertise and results, backed up by our proactive and personalised service. We take pride in serving all our clients in a professional and friendly manner with the advantage of being one of the longest established agents in the City. The areas of expertise include both residential and commercial properties in Sligo and surrounding Counties. 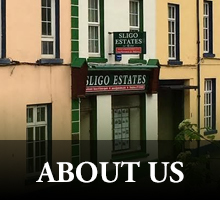 Sligo Estates would be delighted to act for you in the sale or rental of your property and are committed to providing you with an efficient, successful and cost effective service. If you require a Valuation on your property we want to talk to you. Contact us today by phone or e-mail for a free consultation and avail of our unrivaled local knowledge and experience.